Welcome to Your “MyPage™” ! This page is for YOU as our Apexcellor™ valued client and family member. You simply register for FREE. As a member of Apexcellor™, you get this website replicated and personalised for you. So when you use your URL for promoting Apexcellor™ business to the world, you do not need to explain the business to your prospects. It is all done for you here and when they write to us, they will be registered as a referral from you. That means for the next 12 months when any of your referrals, do business with your preferred business advisory company, Apexcellor™. You get paid. Another big advantage of becoming a member is that you will be updated on new business trends, get to share your knowledge and learn from other businesses owners and experts as Apexcellor™ grows its network of members. 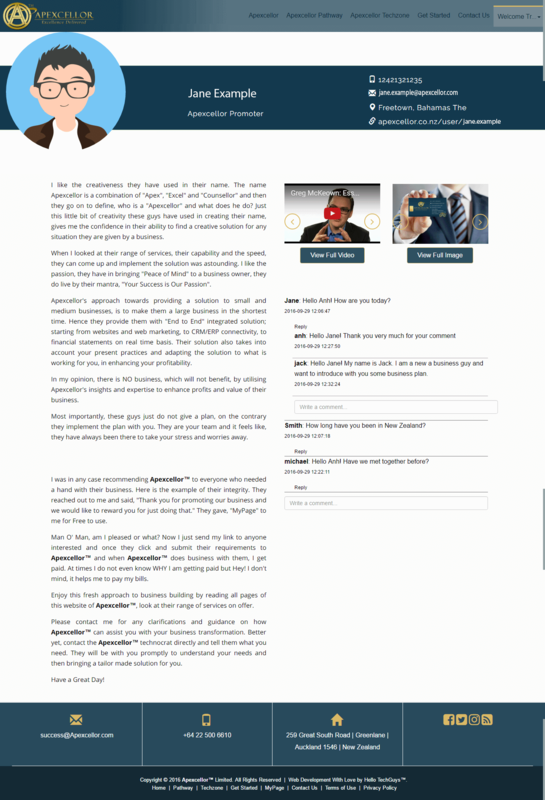 Invite your prospects to Apexcellor™ by sending your link as HTML banner in your Emails or on social media. They understand the business and get to know you on your link. They choose to do business with Apexcellor™. Thereafter they can also create their own “MyPage™”. THIS is not all you get; YOU get two more websites for Free when you become a member with Apexcellor™. See your member’s area for details. Enjoy our website and Welcome to Apexcellor™ member’s area. Signup to Apexcellor™ now and get your page to do your business.